Mirrors are the shiniest of all objects. Their reflections and the way they bounce light can be controlled by their shape and position. One of Bergdorf Goodman's holiday windows made spectacular use of mirrors. "Grand Finale" featured feather-headdressed showgirls posed before a background of slowly revolving shapes created from hundreds of mirrored segments. 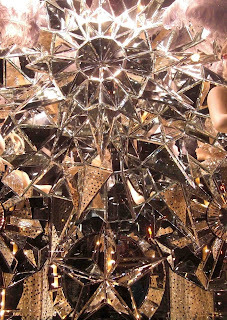 Set at a multitude of angles, the mirrors reflected constantly changing bits of the scene, like a giant kaleidoscope. As it rotated, it summoned up thoughts of stars, snowflakes, disco balls and grand chandeliers. It was mesmerizing.